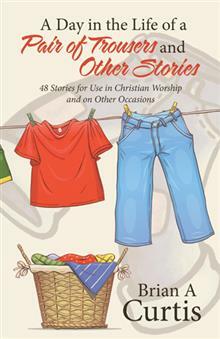 Forty-eight children’s stories designed for use at Christian worship and on other occasions. The stories in this book came out of situations where the presence of children in church could not be guaranteed, but where there was a need to have something prepared in case any walked through the door. They are stories which in multi-centred parishes needed to be portable, and could be produced at a moment’s notice. The stories can be easily added into a service, do not require children—who may not be used to being in church—from coming forward for a children’s talk, and are suitable for churches where the use of modern technology is not an option. Junk Male sat on the coffee table, and although he looked very colourful, he was very sad indeed. And the reason he was sad was that no one had read him; no one had even bothered to look at his colourful pictures. And what’s worse, right at that moment, he had a coffee cup sitting on him, and a number of coffee stains too. So when he thought there was no one left in the room to hear, Junk Male let out a huge wail. And if you’d been there, you would have heard him cry out about not being taken seriously, that he had already been in the house for three days, and that all he’d been allowed to do was to lie around the table and be used as a place mat. No wonder Junk Male wasn’t happy. And what made it even worse was that he knew that when he was moved, he would be simply thrown into a bin, ready to be put out with the rubbish. It’s not surprising then that Junk Male thought he was the most miserable collection of papers that ever could be. But all of a sudden he heard a loud groan coming from the direction of the bookshelves. ‘Who’s that? Who’s there?’ Junk Male called out. And to his surprise, he not only heard a sad voice coming from the bookshelves, but he saw a book wriggling out from amongst the others too. ‘Who are you?’ asked Junk Male. But instead of getting a direct answer, the book began to wail. The book told Junk Male that he hadn’t been around for just three days; he’d been sitting on the shelf for ten years. And, yes, he would love to be on the coffee table, even if it meant being used as a mat. Because at least he would have some use. Anything was better than simply sitting on the shelf, year after year, gathering dust. For sure, the book said, he’d love to be opened and looked at, because the stories inside him were so wonderful and had lots of meaning. He wouldn’t even mind being thrown in the bin and collected with the rubbish. At least that would be better than nothing. Anything would be better than sitting on the shelf and living a pointless existence. Now hearing the book’s story made Junk Male feel so much better about himself. He felt sad for the book. It didn’t change his own situation, but it did help him to put his own existence into perspective. And he realised for the first time that there were others far worse off than he was. He also decided that there was no point moping and waiting to get thrown out. It was time to take action. He needed real purpose in life. He needed to go somewhere else, in the hope of being read. And the book asked if he could come too. He wasn’t doing any good up on the shelf. He might as well go somewhere, anywhere he could be of some use. So they came up with a plan that included Junk Male slipping under doors, in order to open them from the other side, to allow the book through. And before long, they put their plan into action, seeking adventures of their own in the hope that someone would read them. And so this part of their story comes to an end. But their adventures were only just beginning. But Junk Male was bothered. Because despite their talk, he still didn’t know what the book’s name was or what wonderful and meaningful stories he had inside him. But you know, don’t you?